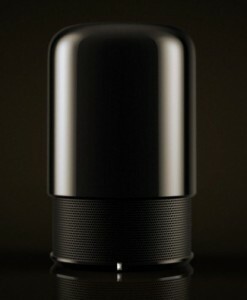 I suppose that today must be “crowdfunded Bluetooth speaker day”, because I just finished with CoverPlay Audio’s Mojo. Now, let’s talk about the HiddenRadio2 Bluetooth MultiSpeaker, another Kickstarter project with Bluetooth and speaker power. This speaker, shaped like a half a pill, is made to reveal itself as a speaker with a touch of a button on top. All of the controls, including play, pause, volume up, volume down, skip forward, skip backward, fast forward, rewind, are there. By the way, you can answer a telephone call or activate Siri from there as well. Yes, this is a speakerphone, and there are a lot of other features. For example, it has NFC, and it is capable for multi-speaker capability. In other words, you can put these speakers in two places for a seamless sound experience. Like the Mojo thin speaker, it also has met its crowdfunding goals. In fact, it set a record for crowdfunded audio projects with $500K with two weeks left in their campaign. You might still be able to get it on its Kickstarter page.